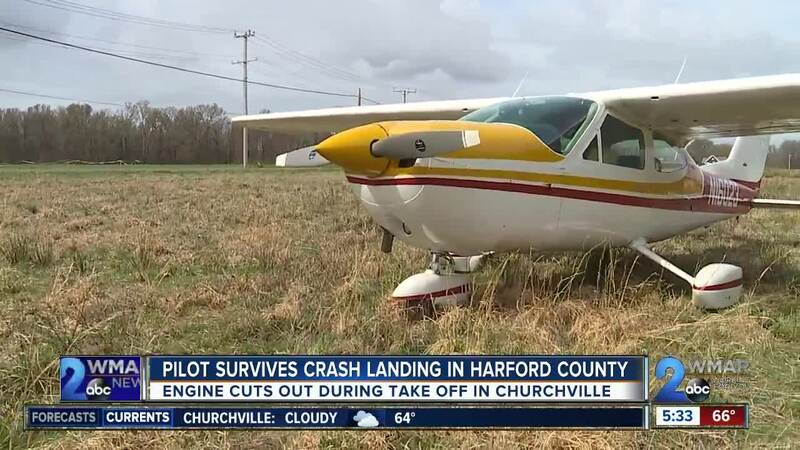 Engine trouble left a pilot to make some frighteningly fast decisions and an impromptu landing in a Harford County field Friday morning. CHURCHVILLE, Md. — Privately-owned aircraft must pass annual inspections, and Steve Miller said his single-engine Cessna had just gotten the "all clear" at Harford County Airport. He was ready to fly it back to its hangar in Fallston when that lone engine went south on him. "Three-quarters of the way down the runway, the engine just cut out, and I was moving too fast... I was ready to lift off so I couldn't stay on the ground,” said Miller, “I had to make the decision right then to try to get airborne." If Miller thought an engine problem on the ground was bad, now he was in the air, when he caught a break. "Fortunately, about two or three seconds later, the engine caught back on and I was able to lift up over the trees, and I cleared the trees and it cut off again," said Miller. Less than a mile down Aldino Road outside Windswept Stables, Monica Fiss Burdette spotted the Cessna in distress. "I see planes all the time, and I saw one getting low, and I was thinking to myself, 'Well, that's pretty low, and it's getting lower and lower, and then he went down," said Fiss Burdette. Miller said turning back wasn't an option, so he searched for a place in a nearby field to sit it down, as Fiss Burdette made a beeline for what she imagined would be a crash site. "I didn't know if people were dead or hurt... you know... what happened," said Fiss Burdette. Drawing on almost four decades' worth of experience as a pilot, Miller successfully completed the shortest flight of his life. "It was less than a minute," Miller told us. "The longest minute of your life?" he was asked. "Yes... trying to figure out what was going on and everything,” Miller responded, “The main thing I had to do was keep the wings level and fly the plane straight. I couldn't make any turns. I was too low and slow." ...He'slucky, if not blessed, that he walked away from the crash landing unscathed. "Somebody always seems to be looking out for me. Yes," he laughed.